Adapted from www.myfoodpassion.net. 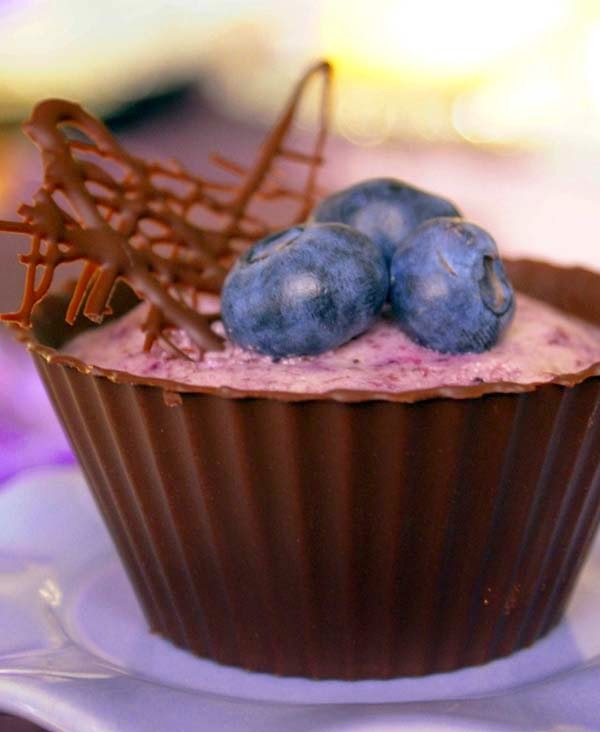 Only the blueberry mousse was used and cardamom was not added. Chocolate cups optional. Beat double cream and 2 tablespoons icing sugar on medium-high until firm peaks form. Purée the blueberries with a blender, add 1 tbsp icing sugar and cardamom. Stir and set aside. Liquify powdered gelatin according to accompanying instructions. If hot water is used, allow it to cool down before proceeding. Pour gelatin into the blueberries and mix well. With a rubber spatula, gently fold in blueberry puree into the whipped cream until combined. Divide mousse into 6 individual dessert cups. Use chocolate cups if you have them. Then let set in the fridge 2-3 hours before serving.